I love old boards with old looking lettering. I've tried hand painting, traced outline fill-in painting and felt pen fill-in. I've tried transferring. I've bought various stencils and experimented on drop cloths. Then a local gal from Chilliwack started an Old Sign Stencils online store and I got to try out something new to me. Donna of Funky Junk Interiors made the stencils which she is now selling at her Old Sign Stencils (online store). She has them produced and mailed to (the consumer) and as a consumer I am thrilled. Love getting an arrow too. Donna has written very clear tutorials on how to use stencils Part 1 How To Stencil a Pallet Crate, Part 2 How To 2 Colour Stencil. I ordered the two stencils (above) and I am practicing stencilling on wood. Donna will be at the Olde Farmhouse Vintage Market, along with a great group of other vintage market sellers, on May 30th in Maple Ridge, demonstrating her stencils on so many great funky and junky pieces as well as selling her inventive and very junky wooden tool boxes (and lots of great junk she has been collecting). Hands on with Donna plus watching and listening to her sign and wooden tool/tote box demonstrations. Gates open at 9 am. 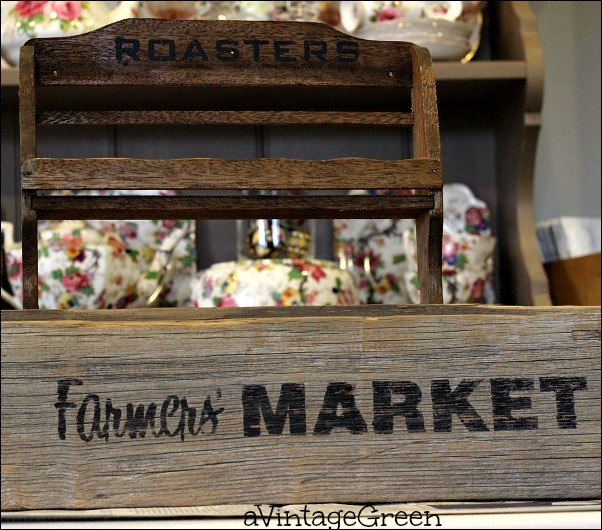 A lovely eclectic range of great vintage treasures to be found for sale from so many other sellers, plus a concession. The stencils I ordered arrived two weeks ago and I went to Michaels to pick up stencilling brushes and some spray glue. Must have gotten glue that is too strong, need to try for a light weight spray glue. The glue I used on the back of the stencil is not easy to remove. 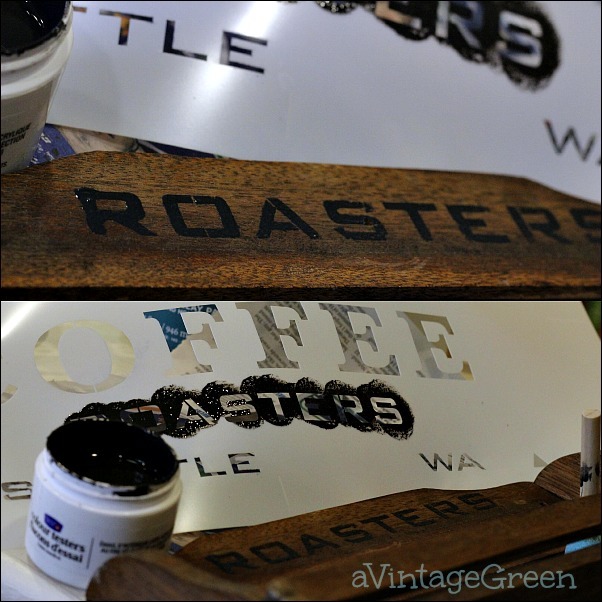 Practiced with the Coffee Stencil on a few pieces of painted scraps of wood (holding the stencil in place) while dabbing the paint. I used a very dry paint sample (thrift store find) and learned that I needed a somewhat thinner (still thick but could be stirred) paint to get a crisper finish. 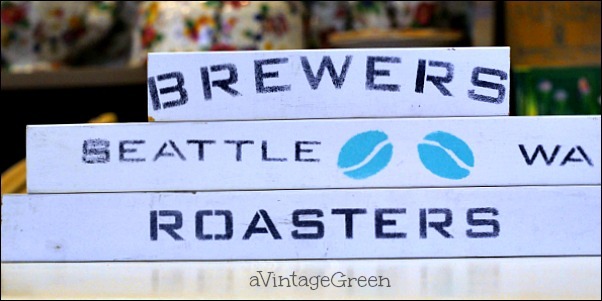 The coffee beans are painted with CeCeCaldwell Santa Fe Turquoise. Tried out a stencil with the (thrifted) stirred black paint on an old 'spice holder'. Too much paint on the R. Need to dab the paint on the newspaper a bit more before starting the first letter. 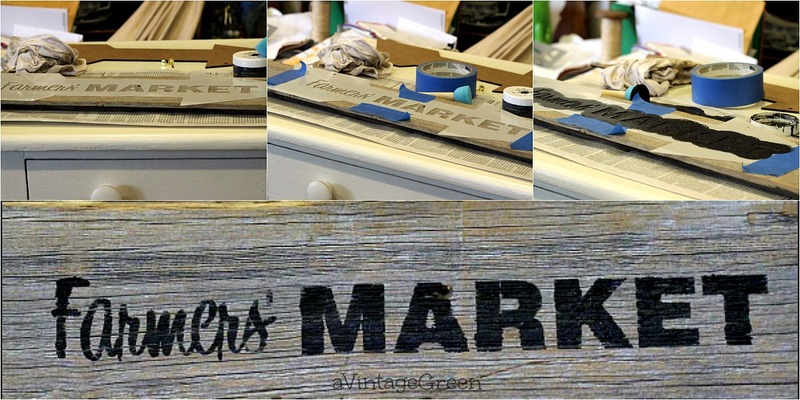 Next try was an old fence board, sanded a bit and wiped clean to remove the slivers and loose bits, and my first try using the Farmers' MARKET stencil. Taped the stencil to keep it still. Used the medium dabber sponge with the the sample tester of stirred black paint. Removed stencil (and washed it immediately and dried) and waited for the paint to dry on the fence board. Again, the F (first letter) got too much paint. The smudge happened when I started to remove the masking tape on the stencil. Nice thing about paint on an old board - you can gently sand off blobs of paint when it is dry. The Purple Painted Lady had a good post on 'how to' stencil here. That was fun. It took me about 2 weeks after getting the stencils in the mail to using them. Lately it has been a bit difficult to make time to do something I want to do as opposed to something I have to do. Working on that problem. Sanded the black letters lightly. I will be making more signs and sharing them on my blog. Hope it is sooner than later. 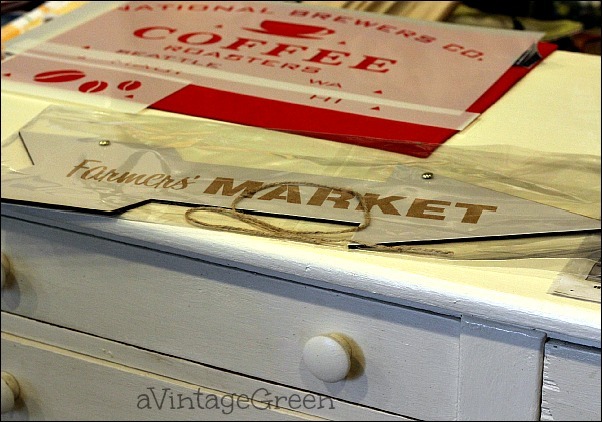 Thanks Donna@Funky Junk Interiors for making your Old Sign Stencils available. I absolutely love old signs (and signs made to look old!) I'll have to check these out. Thanks! Yours look great! I will have to check into these! I love them. Love how these look! Donna is so great at what she does and I'm glad to hear she is doing stencils now. Joy - I've had really good luck stenciling with a square of sponge gathered up into a ball. Dip in paint and then stencil. I also use blue painter's tape to hold it down. I didn't have good luck with the spray adhesive. Your signs look great! You might just try the sponge - fine foam like you use in upholstery. I love your stencils! That weathered board made such a nice sign! Beautiful sign, didn't know Donna made them! You did good. For whatever reason I avoid making signs it just gives me anxiety? Love the weathered board. Have a great Mother's Day! I ordered the Farmer's Market and the Bingo stencils from Donna and I am thrilled with my signs. I love yours and the idea of using them on drop cloths. Wow Joy, look at you go! It does take some getting use to for sure. I was too heavy on the paint for the longest time and foudn the spray adhesive was very helpful. But you're right, it doesn't come off the back. If you just hang them up, it'll eventually go more untacky. Once you're accustomed to having the brush super dry, you won't require the adhesive. All this takes a little time, but you'll be a pro if you keep going like this! Love these stencils! I am a big fan of barn wookd too, I have lots of it in my home! We would love for you to share with us over at Party in Your PJs, our weekly link party. This looks like so much fun! I have never used stencils before. Thank you for sharing these at the #SmallVictoriesSundayLinkup!